Home > Why are genetically identical individuals different? Ask your mum! Why are genetically identical individuals different? Ask your mum! Does the age of a mother influence the traits and characteristics of her progeny, and how? A team of scientists at the Centre for Genomic Regulation (CRG) in Barcelona have addressed these questions by studying tiny, genetically identical C. elegans worms. Their results have been published today in Nature. “We observed that the age of a mother has a major impact on the physiology of her offspring” states Marcos Francisco Perez, PhD student and co-first author of this work. “Surprisingly we found that it is the youngest mothers that produce offspring that are impaired for many characteristics such as their size, growth rate, and starvation resistance” explains post-doctoral researcher and co-first author of the study, Mirko Francesconi. “The offspring of young mothers also have fewer offspring themselves when they become adults,” he adds. “These differences are caused in part because young mothers provide less of a specific protein complex to their embryos,” adds Marcos Francisco Perez. 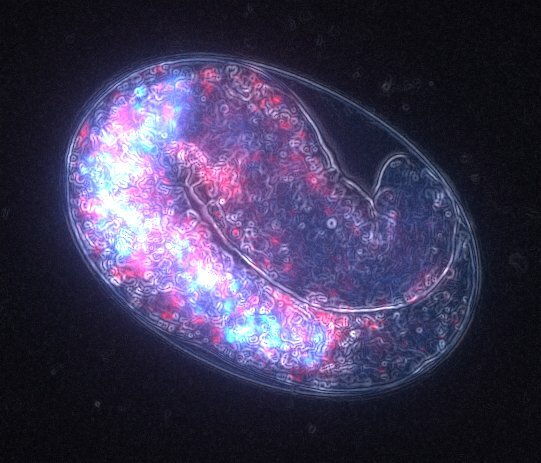 Why would a worm produce low quality progeny early in life? “Producing progeny early in life, even if they are lower quality, has a major benefit because it dramatically shortens the generation time of the species,” explains Marcos Francisco Perez. Ben Lehner and his team are interested in understanding what makes individuals different and how these differences originate in the interactions between genetic, environmental, ancestral and stochastic sources of variation. Worms are a great species to use in this type of study, because scientists can raise large populations of genetically identical individuals in the same laboratory environment. Worms and humans are evolutionarily distant but still share a large fraction of their genes, as well as most of the major genetic pathways which regulate development, metabolism and nutrition. Still, their results concerning the effect of maternal age do not translate to humans but illustrate the kind of ways in which differences between genetically identical individuals might arise. “Our results are also important for the thousands of people doing research in this species. People don’t consider maternal age when designing experiments but now we have shown that it is an important factor,” conclude the scientists. and Competitiveness (BFU2011-26206 and SEV-2012-0208), the AXA Research Fund, the Bettencourt Schueller Foundation, Agència de Gestió d’Ajuts Universitaris i de Recerca (AGAUR, 2014 SGR 831), the EMBL-CRG Systems Biology Program, and the CERCA Program/Generalitat de Catalunya. M.F.P. was partially supported by a FPI-Severo Ochoa fellowship. Some strains were provided by the CGC, which is funded by National Institutes of Health Office of Research Infrastructure Programs (P40 OD010440). Copyright © 2013 Centre for Genomic Regulation. All Right Reserved.